I don't think it gets much FLASHIER than this. If the disco ball's light doesn't bounce off of this, I don't think anything will. You might even blind someone. Perhaps this shirt should come with a warning label.... In any case, they will SEE YOU COMING in this one. My picture can't even do this shirt full justice. The lightweight breathable fabric consists of light blue sequins against a light blue metallic threaded background causing a tremendous amount of REFLECTION. You will definitely STAND OUT AT A 1970s or DISCO PARTY wearing this baby. If you have a party to go to and you don't want to buy pants, then THIS IS THE SHIRT FOR YOU. It will match ANY pair of pants, every day pants or tacky ones. Under comments please state your TRUE CHEST SIZE when ordering so that I can send the shirt that will fit you the best. 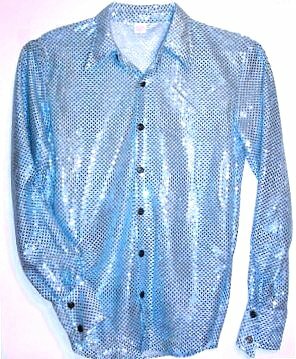 UK Order of Light Blue Sequin Shirt S&H $15.00 USPS Airmail State date needed by under Special Comments which is at the bottom of the order form. Although not responsible for Customs delaying delivery of item. Delivery is 4-14 days. Email if quicker delivery needed.